I’m fairly sure it’s impossible to have a baby without doing at least a little blogging about sleep. When Lydia was a month (or so) she was sleeping GREAT. She’d go to sleep for the night around 8, wake up between 2 and 4 to eat and then go back to sleep until 6 or so. There were even a couple glorious nights where she woke briefly around 10 pm to eat and then slept until 5 am. This was fabulous. I could count on several hours of uninterrupted sleep a night and only 1 wake up. Sadly, it didn’t last. For the last few weeks she’s been on an every 2 hours schedule. She goes to bed between 7 and 8, then generally nurses around 10, 12, 2, 4, and is up for the day at 6. This is considerably more tiring than the 1 wake up a night, as you might imagine. I knew we’d been spoiled by Daniel and his wonderful sleep habits, so when Lydia was sleeping so well so young I thought we’d really lucked out with another good sleeper. I have no idea how to make this better, for a couple reasons. First of all, she doesn’t want to be swaddled for sleep any more. There’s been much middle of the night thrashing around from Lydia because she doesn’t want to be swaddled. So don’t swaddle her, right? Right, except if she isn’t swaddled she repeatedly takes her pacifier out of her mouth and then cries because she wants it. And as adept as she is at getting the thing OUT of her mouth, she is terrible at getting it back IN her mouth. So she doesn’t sleep well swaddled, but she sleeps worse not swaddled. It’s good times. Anyway. I know all kids sleep through the night eventually. (I’ve seen it happen with each of our kids!) But in the meantime, I. Am. Tired. 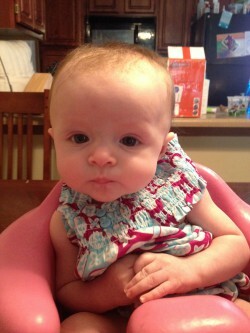 Skeptical baby is skeptical of sleep. I know. There is no good answer. Julia went through this as well and it was truly exhausting. Fortunately I read about the Magical Merlin sleep suit? I’m sure I am getting the name wrong, but it is so big and bulky that she can’t thrash around all that much, and she goes right to sleep and stays asleep! Hmmmm, interesting! I’ll have to look into that. Oh LORD I hear you. Archer was my worst sleeper by FAR, after a few promising first months. I think I ran out of steam on my own baby-sleep discipline and perpetuated some bad habits. Anyway, after a couple rounds of sleep training and finally, FINALLY get the hang of solid foods, he is now sleeping well from 6 to 6. I know you know it will come, but that knowledge makes zero difference when the sun comes up and you’re staring down the barrel of another 10-12 hours caring for small terrorists on no sleep. Hang in there!! She knows she has to be cute if she doesn’t sleep! Right? There are a million “solutions” but I’m well aware that sleep will happen when it happens. There is nothing that can make a person more crazytimes desperate than a frequently waking baby. It’s TURRIBLE. Times like this I am SO GLAD I don’t have to be a productive member of society. Much Sesame Street watching going on these days. Girl. Every night all night. I’m seriously dying. Except Wyatt never slept as well as all that at any point. :(( he’s 5 months, starting to take solids an still wakes every 2-3 hours at night. Sleep is good babies! Let your poor tired mamas rest!